Maybe it was the cute little phrase that caught my eye. "A waist is a terrible thing to mind." It is a great place to find out about tea, coffee,and how to have a 'shagadelic' time with Fondue!! There is a section on breads, cookies, soups and stews!! *Catching Breath* ... AND...if that isn't enough....if you like that little phrase I mentioned earlier then check out the great section with Weight Watcher foods!! 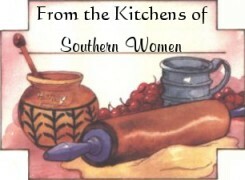 This site has it all and is authored by a sweet little ole' Southern Belle!! "In my heritage, before one meal is finished the woman of the house is planning the next one. We entertain with food, we sympathize with food, we show our love with food, we welcome new neighbors with food. Whatever the occasion is we include food...especially those of us from Southern Country heritage." 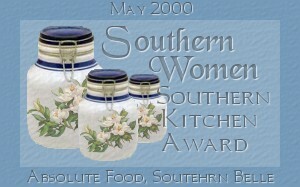 We would love Shirley to have our "Southern Women Kitchen Award for the month of May....for an excellent site that is entertaining, informative and just plain fun. In a large bowl, combine flour, sugar and cinnamon. Cut in butter with a pastry blender until mixture has the consistency of coarse meal. Sprinkle in just enough water to moisten dough. May add additional water if necessary to form ball. Roll out dough on a lightly floured surface to a 12-inch diameter circle. Fit into a 10-inch pie plate. Fold under overhanging pastry flush with rim. Flute to make a stand-up edge. Chill until ready to fill. In a large mixing bowl, beat egg slightly. Stir in sour cream, sugar, flour, vanilla and salt until mixture is smooth. Add sliced apples, stirring gently just to coat apples. Spoon filling into shell. Bake at 450 degrees for 10 minutes, lower heat to 350 degrees and bake 35 minutes longer. While pie bakes, prepare topping. In a small bowl, combine butter, flour, sugar, brown sugar, cinnamon, and walnuts and blend well. Remove pie from oven and sprinkle topping evenly over filling. Return to oven. Bake for 15 minutes longer or until topping is lightly browned. Cool pie on wire rack. Grease two 9-inch cake pans; line the bottoms with waxed paper and grease the paper. Melt the chocolate and butter in a 3-quart saucepan over low heat, stirring to blend well; remove from heat. Beat in the eggs with a wooden spoon. Stir in the sugar, milk, vanilla and salt. Add the flour and baking powder; stir until smooth. Stir in the pecans. Spoon into the prepared pans. Bake at 350 degrees for 30 to 35 minutes or until a cake tester inserted near the center comes out clean. Cool in the pans on a wire rack for 5 minutes. Invert the layers onto the rack; remove the waxed paper. Cool completely. Melt the chocolate and butter in a small saucepan over low heat; remove from heat. Stir in the confectioners' sugar and then the milk. Chill for 1 hour or until of spreading consistency. Combine the cream, confectioners' sugar and vanilla in a large mixer bowl. Sift the baking cocoa over the top; stir to mix well. Chill for 30 minutes. Beat at high speed for 30 to 60 seconds or until stiff peaks form. Place 1 cake layer bottom side up on a cake plate. Spread with the filling. Place the second layer bottom side down over the filling. Spread the frosting over the top and side of the cake. Garnish with fruit slices or chocolate curls. Make graham cracker crust according to directions on graham cracker crumb box. Be sure to bake for eight minutes at 350 degrees. Let cool. Reserve 1/2 cup crumbs for pie topping. Grate one tablespoon lemon rind and sprinkle on crust. Let stand while filling is being made. For filling, beat egg whites very stiff, adding sugar gradually. Mix in a separate bowl condensed milk, lemon juice and food coloring. When this is mixed well, fold into stiffly beaten egg whites. Pour mixture into graham crust, sprinkle with 1/2 cup graham crumbs. Keep refrigerated. This pie may also be frozen for future use. Thank you to MAry Bear for submitting this month's recipes. Visit her homepage and let her know you appreciate her sharing! Looking forward to next month's recipes!! Ladies?